Photo Shoot Flower Background. 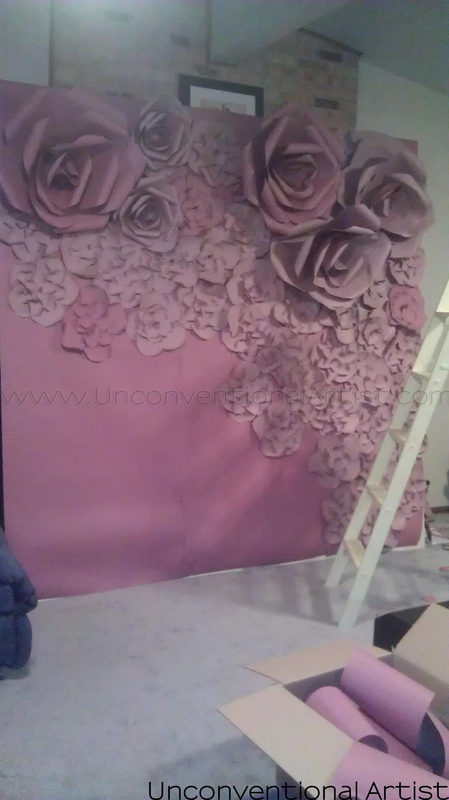 I had a client doing a hair editorial for Valentines day and I wanted to create a romantic Photo Shoot Flower Background (on a budget) aka a large paper flower backdrop. I went to the usually places looking for materials: Michael’s Craft Store, Joann Fabric Store, and Hobby Lobby. But, they didn’t have anything affordable. Then I headed to my go-to clutch store: Home Depot. They always have the coolest things in large sizes. Then, I came across it – Rosin paper. They had two colors: pink with a dark pink on the reverse side as well as a tan with dark tan on the reverse side. Obviously, I went with the pink. The roll of paper was huge (and the paper was thick) and only $10! What a steal of a deal! I left in excitement to start the project. 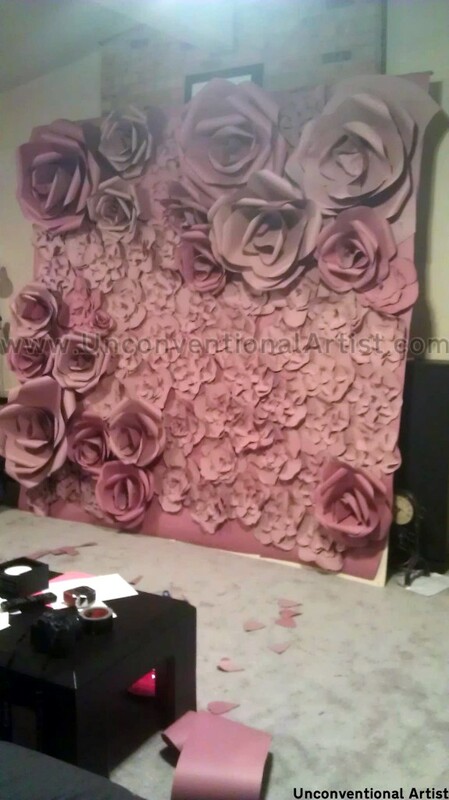 The idea was to use paper to create a 3D flower background. Hooray for DIY projects! The project uses inexpensive materials but is vary laborious. My first step was to figure out what type of flowers I wanted to create. Obvious, since I had to cover a 10×10 surface for the photoshoot I wanted something easy to make so I went with these two types of origami flowers. I used these two instruction sheets to learn how to make them and scaled them appropriately. I made some on the dark pink side and some on the light pink side. Once I got the hang of it, I made a lot of them! 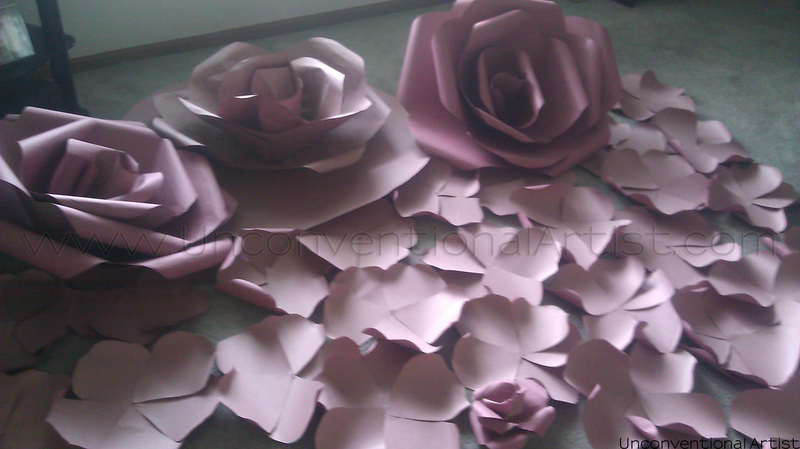 I made a few really large rose ones to use as accents. Then I joined two sheets of Rosin paper together and hung it from a mock wall so I had an easy time gluing the flowers to it! The picture below is the half way point. I used a hot glue gun to do all the adhering to the background. I had to smoosh the bottom of the roses to create a flat surface to attach to the paper. Here is a photo with the whole Photo Shoot Flower Background done. Then this is what we created for the Photo Shoot Flower Background of the shoot. It would be a great window display or visual merchandising piece as well for little cost. 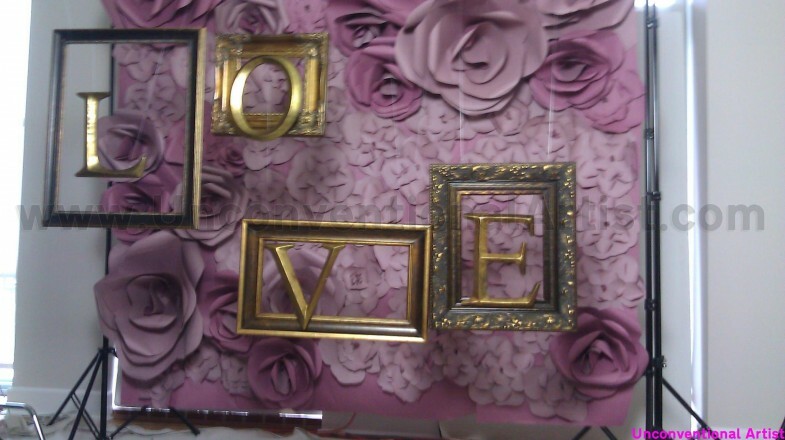 I used gold picture frames and some gold letters that spelled LOVE out to add the final touches! The final Valentine’s day editorial photos are to come featuring this fabulous Photo Shoot Flower Background labor of Love, no pun intended. Stay tuned for more! Jennifer Lynn: San Fancisco based window display artist and visual merchandiser focusing on set design and background construction for editorials! Contact me for more info on my contact page!